Body of Lies is masterfully directed by Ridley Scott and revolves around the gathering and use of information by the United States. Leonardo DiCaprio plays Roger Ferris who becomes caught in a game of politics led by his superior and former CIA agent Ed Hoffman (Russell Crowe). 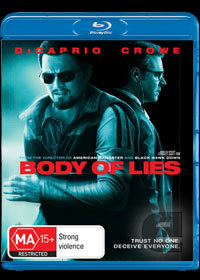 Body of Lies uses convincing actors, intelligent scriptwriters and a fast-moving plot regarding the current turmoil in the Middle East. DiCaprio at times is like Jason Bourne and is the only person able to stop a terrorist named Al Saleem and his followers from beginning their terrorist war on the west. Ferris has also taken the time and respect to learn the language, he falls in love with a local woman and he gains the trust and respect of the chief of Jordan intelligence, played by Mark Strong. He understands the culture and can see the proper way to solve the crimes with the help of this experience but he is constantly undermined by those making decisions across the sea. The message is simple and clear, unfortunately made less effective with the film’s emphasis on suspenseful moments where the bad guys always seem to make the mistake of arguing with the incapacitated hero for just a few minutes too long. The Blu-ray disc implements all of the featurettes and interviews into viewing focus point feature, bringing them up as you choose while watching the film. There is also a commentary track with Scott, screenwriter William Monahan and the author of the book, David Ignatius. All of the features are in high definition. The film itself looks great, with less digital effects and some impressive explosions which are great in high definition.